This episode opens up with Kamen Rider Zi-O right in the middle of battling Evil Kamen Rider Gaim, a weird samurai looking guy. No, you didn't skip an episode! This is how the episode actually starts. The two of them are clashing swords (oh my) and then Zi-O powers-up into Gaim Mode but the transformation didn't go very smoothly. The transformation accidentally drops a giant version of the Gaim Watch right onto his head, leaving Zi-O awkwardly stuck in it. Zi-O gets the correct version of the armor soon after and this new form looks awesomely weird. The new armor looks like a crab suit and his swords are slices of oranges. Zi-O Gaim Mode finishes off Evil Gaim by slicing and dicing him with his orange blades and the day has been saved... Or has it? Zi-O de-morphs into Sougo and is warped to this weird glitched out zone, where he is talked to by a mysterious person with white hair. Sougo is then warped back to the start of his battle with Evil Gaim, only for the outcome to change because Evil Gaim runs away. Sougo is confused and he also thinks that he has seen the White Haired Man somewhere else before. Sougo thinks he saw him when he got the Gaim Watch. 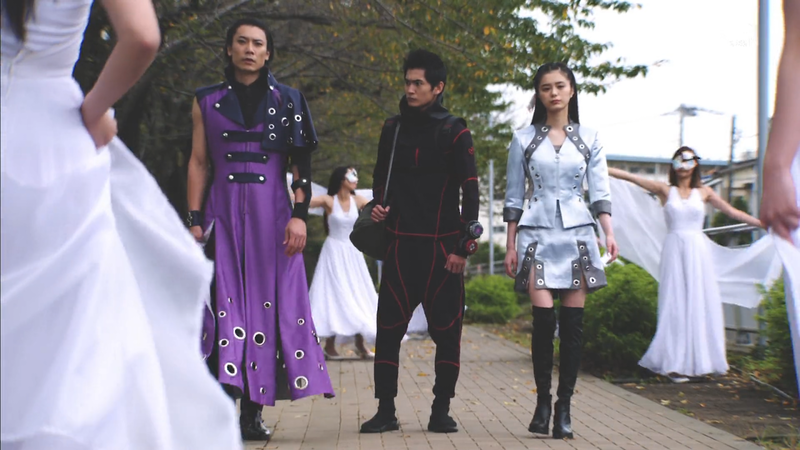 Geiz is alone and he gets confronted by Time Jackers, Ora and Schwartz and they try to convince Geiz to join them but Geiz gives them the silent treatment. We're back at home base where Sougo and Tsukuyomi are getting ready to go out to look for Geiz. Guess who just happens to walk into the shop? It's Woz and he has brought in a broken clock and Sougo's Uncle gets so excited that he won't give up on trying to fix it. Woz's main reason for being at Sougo's place is to discourage the heroes from finding Geiz because he isn't important to Sougo's future reign. Sougo just ignores Woz and goes out looking for Geiz anyway. While Sougo is going out the door, Woz notices that someone is hiding behind a plant that's inside of Sougo's house. Woz and Sougo's Uncle argue over the broken clock and they notice that Sougo didn't really leave. Sougo pulls out a newspaper and shows off an article about boy band dancers going missing and that he suspects that it is the Time Jackers doing the dirty work. Sougo and Tsukuyomi then go out to investigate. We are now at a back lot where two boy band members are talking to each other. One of the boy band members is a little nervous because he thought that the other member can turn into a monster. Turns out that the guy was right, the other boy band member turns into Evil Gaim, un-zips a hole in the universe and throws the boy band member in. Time Jacker Schwartz is watching this all go down and he is trying to teach Geiz a lesson but Geiz still gives Schwartz the silent treatment. 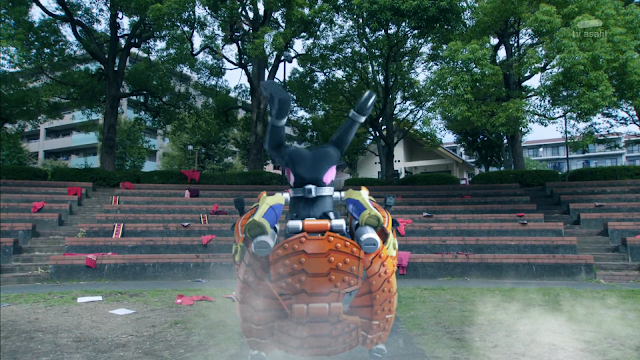 Evil Gaim goes berserk and attacks anyone that he sees but unlucky for him, Sougo and Tsukuyomi join the scene. There's no battle, another portal unzips and it takes Geiz away to another realm and then Schwartz just storms off. Sougo and Tsukuyomi need to figure out how to save Geiz and Sougo knows how. 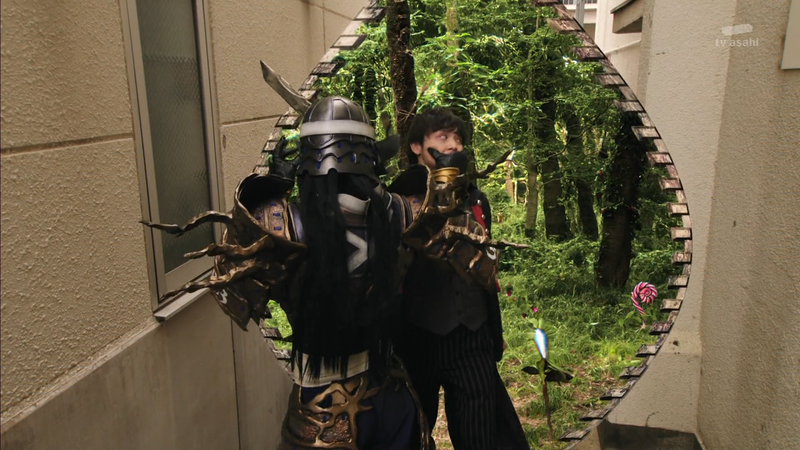 Tsukuyomi and Woz are confused as to how Sougo knows who is causing all of the trouble. Geiz is not dead! He is in another dimension! A dimension where boy band members are being attacked by monsters that look like the love child of Gamera and one of the angels from Evangelion. Geiz fights off the monsters and then meets up with Kumon Kaito. 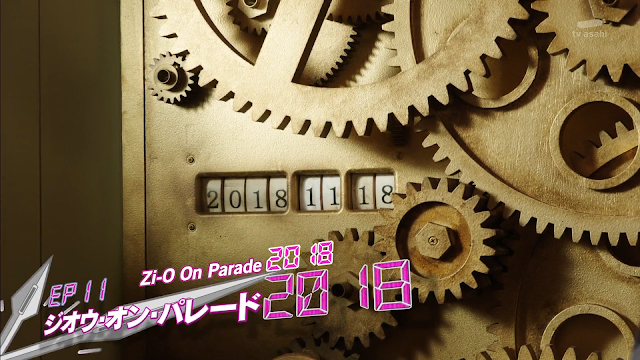 Sougo's Uncle is fixing up Woz's clock and is also chatting to Sougo about how he knows Woz. Tsukuyomi returns and talks to Sougo about Evil Gaim but Sougo has no idea what she is on about and goes off. Once Sougo leaves, he comes back but this wasn't the Sougo that had left, this is Sougo from a different time. Tsukuyomi is upset and confused and Sougo tells her everything about Evil Gaim. Tsukuyomi is still confused about how Sougo knows about all this (she doesn't know that she is talking to Future Sougo yet), chases him out of the house. Future Sougo switches places with Present Sougo before Tsukuyomi catches Future Sougo. Tsukuyomi talks to Present Sougo about the situation but Present Sougo is just confused. Tsukuyomi finally gets her eureka moment when she notices that the two Sougo's have different clothes on. Present Sougo is still confused about everything. 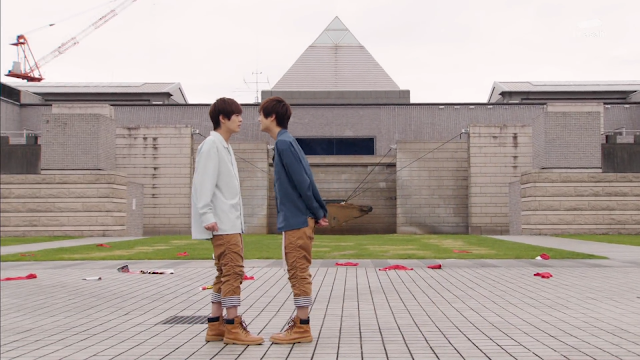 Geiz and Kaito are trying to escape from the weird dimension and the two have a lovely chat while doing so. Geiz goes on about how he has to stop Zi-O and Kaito goes on about how he notices that Geiz's voice is full of hesitation. Next we have a scene of a dance group named Team Barron performing in front of the crowd (no colorful break dancing gang members to be found here). Tsukuyomi and Sougo (Present Sougo that is) are watching the performence and Tsukuyomi points to one of the members and tells Sougo to beat him up because he is Evil Gaim. 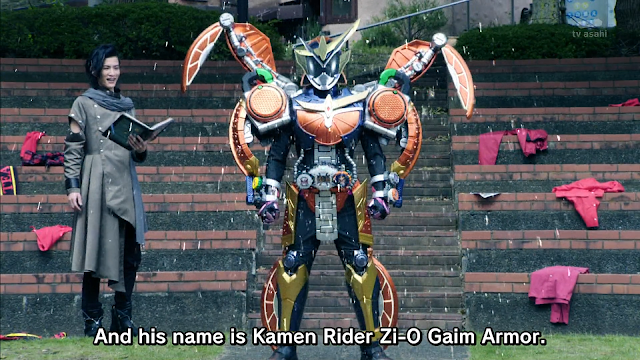 Sougo is confused because he doesn't recognize Evil Gaim but Evil Gaim recognizes Sougo. IT'S HENSHIN TIME, BABY! Sougo morphs into Zi-O and gets into a sword fight with Evil Gaim and the crowd gets the heck outta there. Shortly into the battle, Zi-O Tonkas up into OOO Mode (you know, because this armor looks so yellow and plastic like a Tonka truck). Zi-O (or Zi-OOO as I like to call this mode) claws at Evil Gaim. Woz is watching and he notices something wrong about the battle and how it is different from how it is supposed to be. Evil Gaim grabs Zi-O and tries to warp him to another time but Zi-O is saved by... Well, Zi-O. Yup, Future Zi-O has joined the battle and all that Present Zi-O has to say about the situation is, "Oh, Well" and the two of them gang up on Evil Gaim. Our two Zi-Os beat up Evil Gaim and Present Zi-O wants to finish him off but Future Zi-O says that they can't yet. While the two Zi-O's are talking they get blown up by Evil Gaim's Hadouken from Hell. 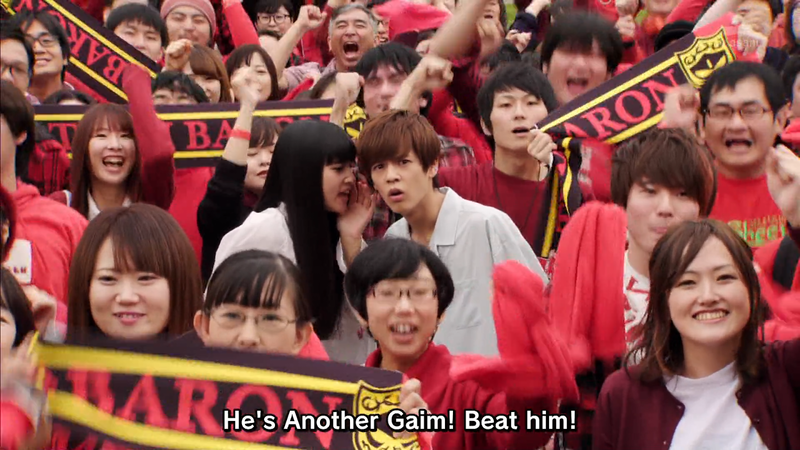 Evil Gaim escapes, Sougo is sore and once he gets up, he is in shock because he sees another one of him in the flesh. The story for this episode is much less conventual than the standard one and it was both a little confusing and awesome seeing the show doing something different. This episode was also more direct than the typical Kamen Rider episode, they didn't waste time with pointless scenes, they just jumped right in head first into the main plot. This episode will make you think that you've missed some super secret episode but you'll get over that very quickly. It's nice to see that Sougo is being used twice as much as he normally is (*badumtish*). Bad puns aside, I did like how he was used, it actually showed importance in his character and reminded us all why he is the main character. I also liked how the two Sougo's acted differently, it was appropriate that Present Sougo was confused because he has no idea what was going on. Future Sougo was more serious and on point because he knew exactly what was going on. Not much Geiz in this episode but I'm not worried. They are building up something big with him and I am looking forward to seeing how it will turn out. I know! Doing the doppelgänger routine is very stock for a TV show and it has always been a cheesy thing. What is important is getting the doppelgänger act to be fun and that's exactly what they did. The action in this episode was quite good but we did get a lot of awkward CGi though. The Zi-O Gaim Armor looked uber weird to the point where it is one of the most awesome Kamen Rider suits that I have ever seen. I mean it has crab legs and orange slices for swords, what's not to love? Overall, very interesting episode and doing something different is a risky thing to do but they pulled it off. It's one of those entertaining episodes where you can just shut off your brain and enjoy the Kamen Train. I'm giving this episode a 7.5 out of 10.